A couple days ago, I finally got the chance to drive over to Marjory Stoneman Douglas High School. It is only 25 minutes from my house. I wanted to see it, touch it, and feel it in my heart, for myself. For me personally, I thought it was an important thing to do, not just as someone who speaks to and cares about children, but as a human being. 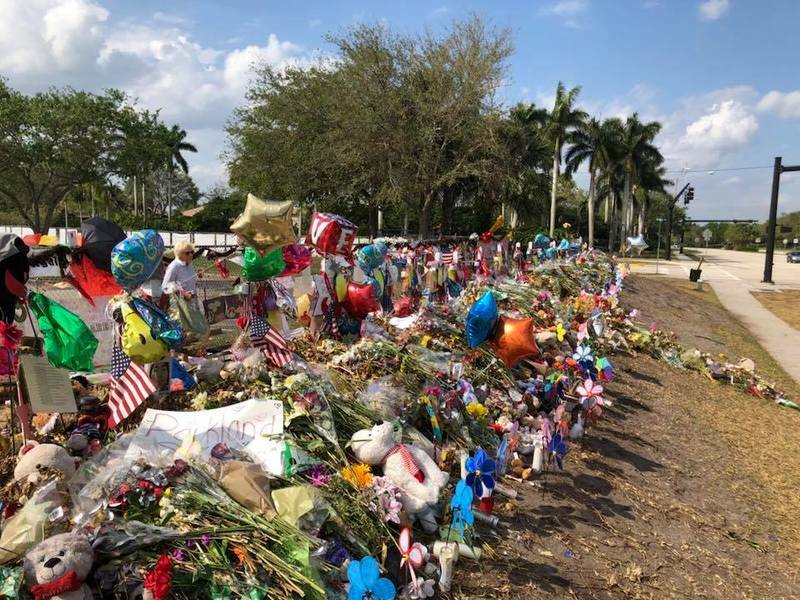 At the outer fence of the school, there was a 150-200’ stretch of signs, teddy bears, balloons, religious touches, cards, pictures, candles and flowers. There were THOUSANDS of flowers. I was there for about 45 minutes, and I strolled along the fence with my hand over my mouth. Sadness filled my heart and tears filled my eyes. Silence came over me. Not because I didn’t have anyone to talk to, but because I just... couldn’t possibly find words if I tried. It was really, really hard being there. Looking at all the names, seeing their memorials. There were 17 crosses, placed in the ground as markers, along a grassy knoll, and each cross had a name and picture, and a mound of other various tokens that people had left for them. (See this in the first picture.) I read as much as I could, and the simplest messages particularly stood out to me. “You were such a sweet friend and good dancer.” “I miss seeing you every day.” “I miss spending time with you.” Tiny little things that we take for granted. It was gone, and they were gone, in a second.